I love my little Hat & Mitt Bag so much that I had to make another one, but, this time, a little larger. 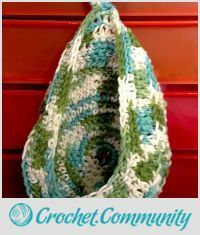 This new one is perfect for my smaller crochet projects, with the yarn being pulled from the middle of the ball. I stick the ball into the basket and off I go. Then when I take a break, I can put the project (and any notes needed) into the basket and there it waits for next time. 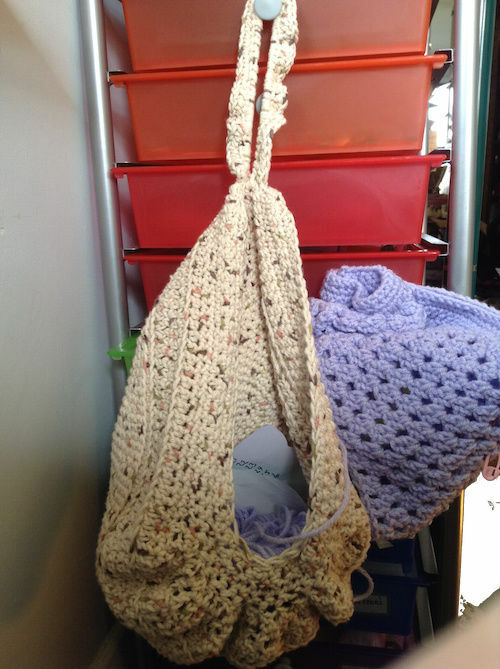 It also has room for a second project storage: yesterday I had 2 projects on the go and they both fit in the bag. It works wonderfully for me. repeat this, increasing the amount of 1 sc stitches each time … till there are 12 sc stitches in-between the 2sc increases. turn and slip stitch or sc around the handle again, secure into base stitch and tie off. I need to make these to hang on my boys bedroom door for the hats and gloves.